Introducing the brand new Lensbaby Burnside 35 mm lens. Photo by Tracy Munson. 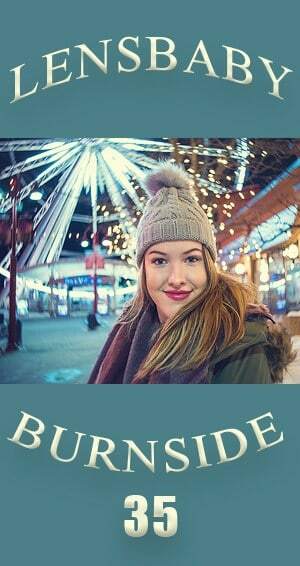 Today, Lensbaby announced their latest bundle of joy, the Burnside 35. They were kind enough to send me a top-secret advance copy of the lens a couple of weeks ago so that I would be ready to share my thoughts with the readers of Improve Photography. Here’s my take on the Burnside 35. The solid construction of the Lensbaby Velvet series meets the swirly blur of the Twist 60, in a wide 35mm focal length suitable for landscapes and environmental portraits. That would be enough to grab my attention on its own, but they didn’t stop there! The Burnside 35 has a second aperture dial that controls the amount of vignetting and detail in the swirly edges, similar to a Petzval lens. Intriguing enough to get me outside and shooting in Toronto in February…no small feat. I may have cursed them a little bit while trudging through snow and freezing my fingertips. 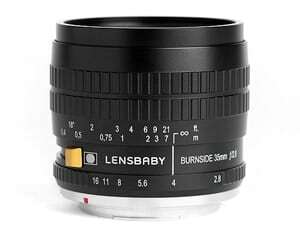 The Lensbaby Burnside 35 is a manual focus, manual aperture lens for full frame and crop sensor cameras. Like the Velvet lens series, it is a very solidly built metal lens, not a part of the tilting optic swap system. It weighs in at a very manageable 13.2 oz (374.21g) and is only 2.75 x 2.75 x 2.625 in (6.99 x 6.99 x 6.67 cm). That makes it an easy addition, even to a camera bag as crowded as mine! The manual aperture ranges from f/2.8 to f/16. There are actually two separate apertures in the camera, the main 6 bladed aperture that is controlled by the aperture ring and a secondary 8 bladed aperture, controlled by the brass coloured slider on the side. The primary aperture functions, as usual, controlling the depth of field and the amount of light that is let in. The secondary aperture affects the amount of detail and swirl in the blurred areas and creates a dark vignette. The new Lensbaby Burnside 35 is small and light enough to walk around with all day, or to toss into a crowded camera bag. Minimum focusing distance is 6 in (15 cm), the maximum distance is infinity. The lens is constructed of 6 multi-coated glass elements, in 4 groups, and takes a 62 mm filter. It will retail starting at $499.95 USD. Hands-on, the lens feels light but sturdy and substantial. The manual focus ring moves smoothly and has enough firmness to it that you can be very precise. The primary aperture ring has nice, firm clicks at each aperture setting so that it won't easily be jostled and changed accidentally. The lens cap is metal, just like the Velvet series lenses. It stays on fairly well but is more easily knocked off in your bag than the lens caps that click into place. Even at its widest aperture, f 2.8, this lens is very sharp when you nail the focus. Stopped down to f16, it is super sharp in the center, but still loses some sharpness around the edges. Even in the center, it will not really produce a starburst light effect at f16. None of this bothers me especially – if I'm using a selective focus lens, it is almost always wide open or close to it. 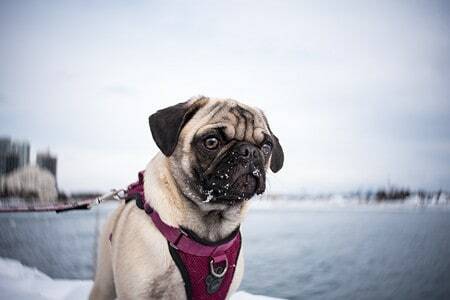 A super cute pug mix, photographed using the Lensbaby Burnside 35 mm lens. 100% crop of focus detail at a wide open aperture of f/2.8 in the inset. Photo by Tracy Munson. As is typical of a manual aperture lens, it can be difficult to focus through the viewfinder at smaller apertures because less light is getting through. You won't notice this when using a lens that has the aperture controlled by the camera because it is always wide open while you are focusing and only snaps shut when you press the shutter button. There are two solutions to this problem, depending on your shooting scenario. One is to use a tripod (or very steady handheld), focus with the lens wide open and then change the aperture afterwards. This is less tricky than it sounds because your depth of field is so much greater as you stop down that focus can be less precise. The other solution is to use your camera's live view, which shows you the image on the sensor, not the image through the lens. It is also difficult to focus manually through the viewfinder outdoors in February in Toronto, especially when you wear glasses. As I do. When photographing colorful scenes, the Lensbaby Burnside 35 has a lovely cinematic quality. Photo by Tracy Munson. The wider 35mm focal length of the Lensbaby Burnside 35 means that depth of field is greater and infinity focus is reached closer than with longer focal lengths. 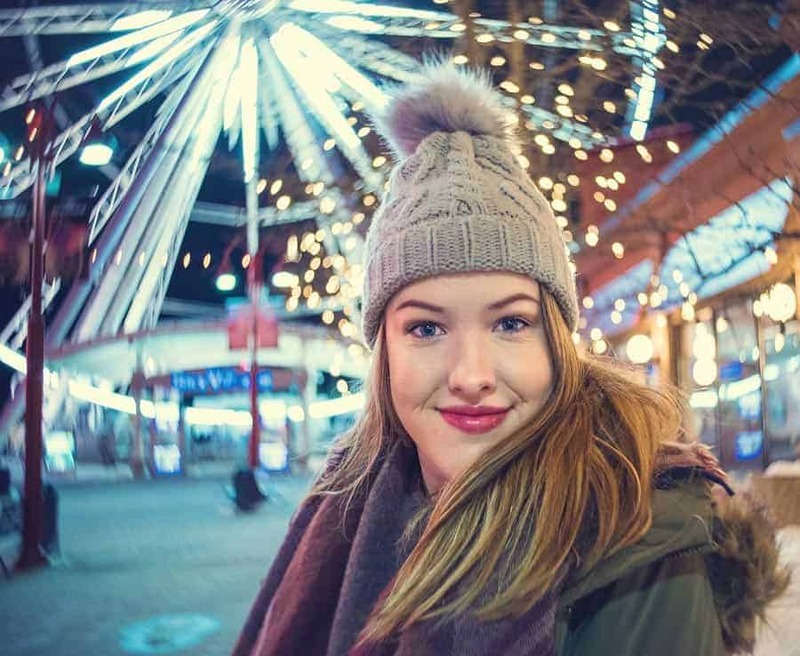 This means that, unless you have a subject very close to the lens and a background very far away, the swirly blur effect will be quite subtle, even wide open and with the secondary aperture slider all the way up. While photographing people walking ahead of me, I found that I reached infinity focus before they were very far from me. I'm a bit of a shallow depth of field junkie, but I can see where this more subtle effect might be more appealing to those just dipping their toes into selective focus. It is definitely easier to achieve sharp centre focus. 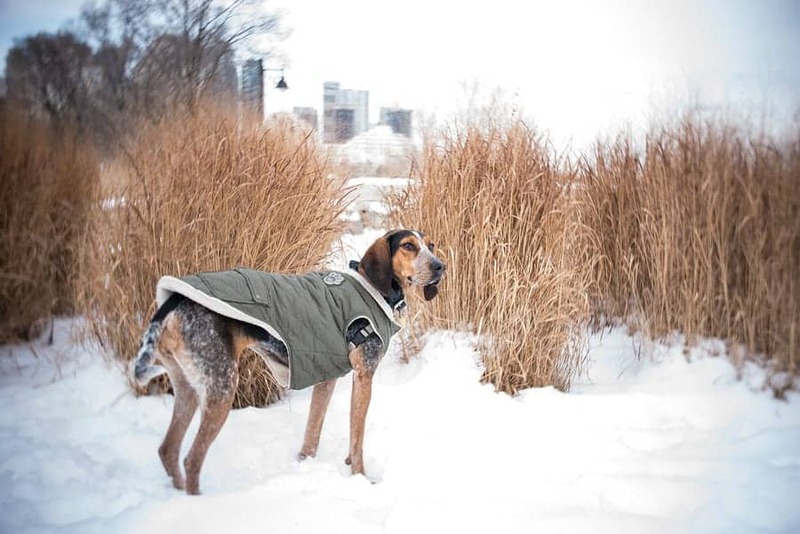 This environmental portrait of a beautiful blue tick coonhound shows a more subtle blurring and swirling around the edges and background than we would see with a longer focal length. Photo by Tracy Munson. The 6-inch minimum focusing distance makes it possible to get up very close to your subject, while still showing a great deal of background, and this is where I feel the lens really excels. Longer focal lengths are great for isolating the subject, but often lose the context of the scene. Close to your subject, the background can have a more traditional dreamy soft blur, or a swirling blur that almost looks painterly, like brush strokes. The choice is yours, using the secondary aperture slider. Close up photos taken with the Lensbaby Burnside 35. On the left, the soft dreamy blur effect with the secondary aperture slider pushed down. On the right, the dark vignette and detailed swirling blur achieved when the slider is pushed up. Photo by Tracy Munson. Another example, showing the effects of the secondary aperture slider on the Lensbaby Burnside 35. Photo by Tracy Munson. The Lensbaby Burnside 35 favors centered compositions, where the sweet spot of tack sharp focus is found. With wider apertures, there is significant blurring around the edges, even when an object is on the same focal plane. This makes it difficult to follow the compositional rule of thirds unless you crop afterwards. Careful composition is extra important with this kind of swirly blur lens because cloning out distractions later is a nightmare. I'm quite proficient at removing leashes in photoshop, but the Burnside 35 and the Twist 60 make me tear my hair out in frustration. The dark vignette of the Lensbaby Burnside 35 has a bluish cast that helps add color to grey skies. Photo by Tracy Munson. When you push the secondary aperture slider upwards, it adds a dark vignette to the image and brightens the center. The vignette can be a big help in making your subject pop and stand out from the background. It darkens skies and minimizes distractions. There seems to be a bluish tone to the vignette which helps add some color to the grey February skies around here right now. When stopped down to f16, it will create a solid black vignette. The vignette effect will be less noticeable on crop sensor cameras. So, how does the Lensbaby Burnside 35 stack up against comparable lenses? It sets itself apart immediately by being the widest of any of the swirly blur lenses, including the Lensbaby Twist 60, the Russian Helios, or Lomography's Petzval. The build quality is in line with the Lensbaby Velvet series, which is higher quality than the Twist 60 (but correspondingly heavier). Most intriguingly, it introduces the secondary aperture bokeh control slider, at a much lower price point and with way less hassle than the Petzval lenses. (Though lacking the different shaped special effects apertures of the Petzval). In other words, it doesn't exactly compare with any of them, the Burnside 35 is its own thing. The Lensbaby Burnside 35 has some intriguing properties – I look forward to spending more quality time with it in warmer weather! Photo by Tracy Munson. I'll admit to having some frustrations with this lens at first. I know that the swirling blur properties are at their best when photographing colorful scenes, rather than grey, barren, winter landscapes. With that said, it forced me to get outside my comfort zone and get creative, which is exactly why I love Lensbaby lenses in the first place. I'm super stoked to get out in the Spring and photograph wildflower meadows and rural scenes with the Burnside 35. I loved the cinematic quality of the colors and depth when I was able to find a vibrant scene. Will it be my go-to lens for straight up landscapes? Not likely. But it might be my choice for moody scenes like lonely trees, derelict barns, urban decay, abandoned houses, old cemeteries…you get the idea. I suspect it may also find its way into my bag for pet portrait sessions. 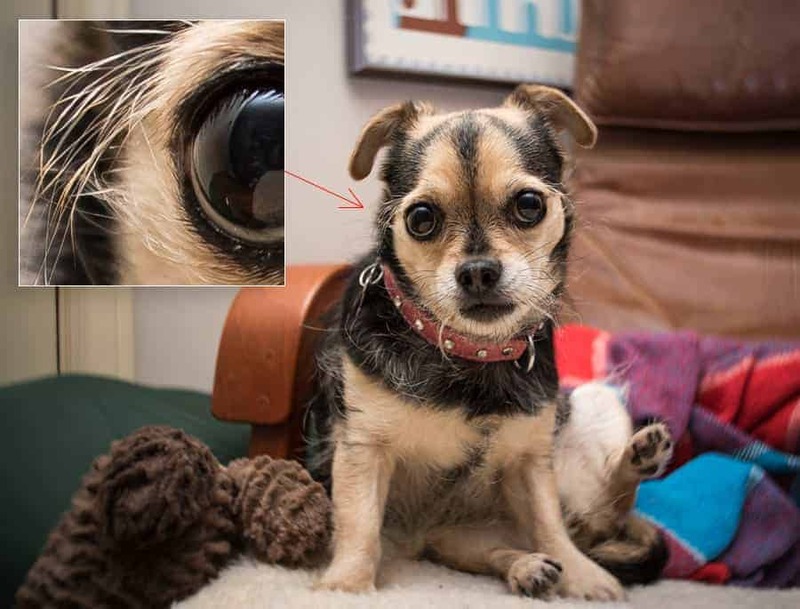 While I would never rely completely on a manual focus lens for pet photography, I always bring along a Lensbaby for a few creative shots once I'm sure I have captured the essentials. The greater depth of field afforded by the wider focal length increases the chances of getting usable photos, even with uncooperative subjects. I've been trying to incorporate wider, more environmental portraits, along with my longer focal length portraits and the Lensbaby Burnside 35 may be just the ticket. If you are feeling bored or stagnant in your photography, a selective focus lens like those made by Lensbaby can give you a fantastic inspiration boost. The Burnside 35 would be a great introduction for someone new to this type of creative lens, or for someone (like me) who already has a ton of longer focal lengths and is ready for a change.